The CHI St. Luke's Health-Baylor St. Luke's Medical Center/University of Houston College of Pharmacy Infectious Diseases Pharmacy Fellowship combines infectious disease clinical practice and research in a two-year program. The fellow is trained as a clinical practitioner in the Baylor St. Luke's Center for Antimicrobial Stewardship and Epidemiology (CASE) with patient care, monitoring, research and teaching components. The first year will focus more heavily on clinical activities, similiar to an infectious diseases residency. The second year will have a more extensive research focus. An optional third year of research may be available for interested candidates. Research is conducted in collaboration with expert faculty researchers from the University of Houston College of Pharmacy. 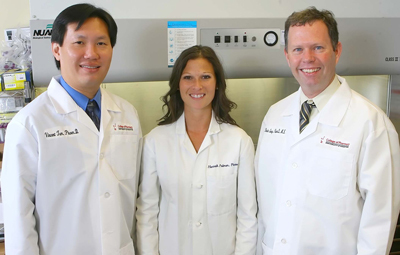 The primary preceptors of the ID Pharmacy Fellowship program are, Vincent H. Tam, left, and Kevin W. Garey, right, UHCOP professors and Baylor St. Luke's Medical Center clinical specialists, and Hannah Palmer Russo, Fellowship program director at Baylor St. Luke's Medical Center. A series of rotations designed to provide comprehensive learning experiences will be offered regarding advanced infectious disease pharmacotherapy issues. Experiences include, but are not limited to, pharmacokinetics/ pharmacodynamics, medical microbiology, antimicrobial monitoring, pharmacoeconomic issues with antimicrobial therapy, and infection control. Experientials with immunocompromised patients, critically ill patients, and general medicine patients are included. The fellow is trained in healthcare informatics to support clinical decision making involved in optimizing clinical outcomes while minimizing unintended consequences of antimicrobial use. The fellow will be required to engage in teaching and preceptorship of students during selected rotations. The following documents are necessary to be submitted to the Program Director as part of a complete application for the Infectious Diseases Pharmacy Fellowship. The deadline for application is January 5 of each year. d) any information about yourself and your candidacy which may not be apparent on other documents. This is waived if you are more than five years' post-graduation. The transcript can be an unofficial copy. Three letters of recommendation and the ASHP-developed recommendation form are required. If you are within three years post-graduation, one letter should be from a faculty member, specifically from a clinical rotation preceptor; one letter from your pharmacy practice residency program director; and one letter from an employer or from someone outside the profession. If you are more than three years post-graduation, one letter should be from an employer/supervisor, one letter from your pharmacy practice residency program director, and one letter from someone outside your employment. A faculty member still can be used if an ongoing relationship has been maintained. No set format is required for the letters, but they need to address your potential for success in the residency program. An on-site interview is considered very important and is normally required for a complete application. Call 832-355-3114 to arrange and discuss this requirement. The on-site interview is normally a full day and will include your presenting a 20-minute in-service on a pharmacy/pharmaceutical topic of your choice to a group of pharmacists. For more information, please visit the Baylor St. Luke's Medical Center Web page. It is anticipated that one fellow per year is admitted to the program. However, in certain years, more than one fellow may be recruited. For availability of additional positions in a given year, please contact Dr. Kevin Garey at kgarey@uh.edu.